, a learned English divine, was born at Haxay in Lincolnshire, in 1707. His father was vicar of Haxay, but both he and his wife died when their son was very young. The provision made for him was 400l. which barely defrayed the expence of his education, first at Epworth, and then at Gainsborough. He was then entered of Lincoln college, Oxford, where he obtained a small exhibition, but afterwards was elected to a fellowship of Magdalen, which extricated him from many difficulties, his poor inheritance having been long before expended. He took his master’s degree at Lincoln previous to this, in 1733, and when admitted into orders preached before the university with great approbation; and becoming known as a young man of much learning and personal merit, Dr. Smallbroke, bishop of Lichfield, who had appointed him his chaplain, collated him successively to the vicarage of Eccleshall, and the curacy of Gnosall, to which were afterwards added a canonry of Lichfield and the vicarage of Hanbury, on which last promotion he resigned Gnosall. The whole, however, of these preferments, even with the addition of his fellowship, were scarcely equal to his expences, for he had very little notion of accounts, or care about worldly things. 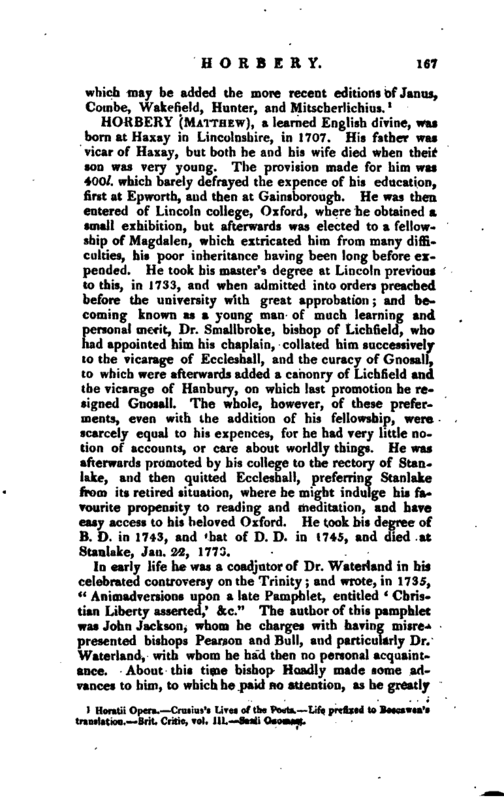 He was afterwards promoted by his college to the rectory of Stanlake, and then quitted Eccleshall, preferring Stanlake from its retired situation, where he might indulge his favourite propensity to reading and meditation, and have easy access to his beloved Oxford. He took his degree of B. D. in 1743, and that of D. D. in 1745, and died at Stanlake, Jan. 22, 1773. In early life he was a coadjutor of Dr. Waterland in his celebrated controversy on the Trinity; and wrote, in 1735, “Animadversions upon a late Pamphlet, entitled ‘ Christian Liberty asserted,’ &c.” The author of this pamphlet was John Jackson, whom he charges with having misre* presented bishops Pearson and Bull, and particularly Dr. Wateiiand, with whom he had then no personal acquaintance. About this time bishop Hoadly made some advances to him, to which he paid no attention, as he greatly | disapproved his notions. By desire he published occasional sermons, but his principal work was his treatise on the “Eternity of Hell Torments,” which appeared in 1744, and was written at the solicitation of bishop Smallbroke. 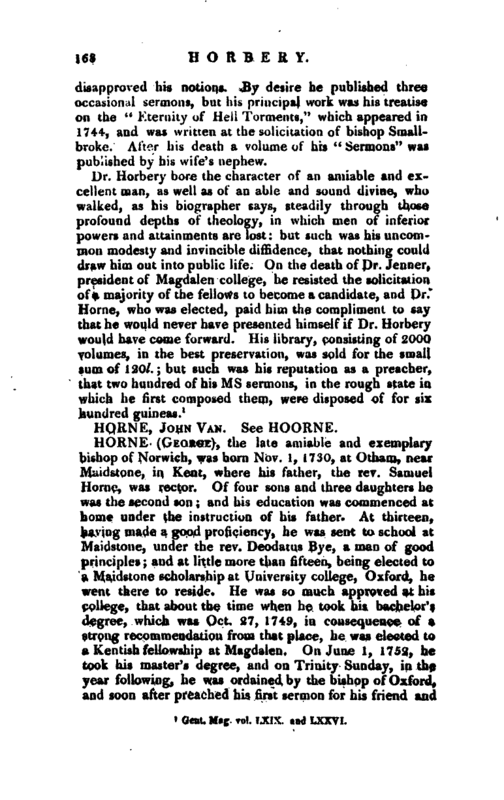 After his death a volume of his “Sermons” was published by his wife’s nephew. Gent. Mag. vol. LXIX. and LXXVI.